Posted by admin in activity reports, eruptions, Fukutoku-Okanoba, Japan. Fukutoku-Okanoba is a submarine volcano which is part of the Volcano Islands group, which is about 1000 km south of the main Japanese archipelago. Submarine, but only just, for its summit lies a mere 14 metres beneath the surface. 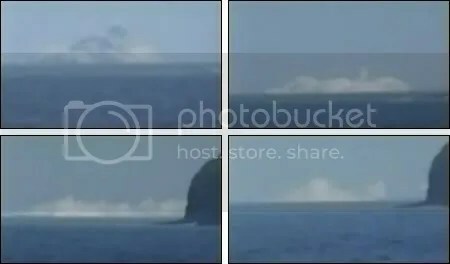 This week it has been erupting, the first eruption (or, if you are British news channel ITN, ‘smoke explosion’) of Fukutoku-Okanoba since 2005, and the Japanese Coastguard caught the eruption on video. Four still images from the video can be seen above, showing steam billowing out and some dark-grey ash erupting from the ocean. Posted by admin in Costa Rica, Poás. You may recall our report of a phreatomagmatic display that Poás volcano in Costa Rica put on to celebrate Christmas Day: well, you can now see a video of the event – ‘Central Georgia couple captures video of erupting volcano’ (also at YouTube). There is also an interview with tourist Tom Wellman, who made the video. Strange remark 1: ‘this type of volcano doesn’t put out liquid lava. Instead it puts out a dry lava with steam’. Strange remark 2: ‘Tom says that this is the first time in the history of Costa Rica that anyone has recorded video of an erupting volcano’. Not really, try this. Costa Rican newspaper La Nación has some nice still pictures of the Poás eruption, taken by Kristina Kremer. UPDATE 11 February 2010. Tom Wellman has provided some clarification regarding his video: please see his comment below. Posted by admin in current research, Pacific. An explosion at the West Mata Volcano throws ash and rock, with molten lava glowing below (image courtesy NSF/NOAA). In May this year scientists studying the West Mata submarine volcano in the south-west Pacific as part of the NOAA Vents Program captured the deepest undersea eruption yet filmed on video (as your favourite volcano bloggers reported at the time). The findings and images have just been presented at the AGU Fall Meeting in San Francisco: the NOAA has two videos and a wealth of still imagery. West Mata is at the northern end of the Tonga Arc, and rises to 1174 metres below sea level. The water around the vents is highly acidic: microbial life is present, but shrimps are the only form of animal life to thrive around the vents. Posted by admin in eruptions, Pacific, submarine volcanism. Over at Discovery News there’s a fascinating report on the undersea eruptive activity revealed at West Mata in the South Pacific by a team of scientists investigating neovolcanism in the NE Lau Basin. 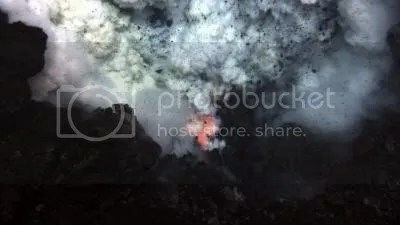 There is some dramatic video footage of the actively erupting (and appropriately-named) Hades and Prometheus vents on West Mata, captured by the team’s Jason-2 ROV. Posted by admin in United States, web resources, Yellowstone. Jake Lowenstern is the scientist-in-charge at the Yellowstone Volcano Observatory. There’s a three-part presentation by him available on YouTube, talking about Yellowstone and the work his team does there. For more, including links to all three videos, see Callan Bentley’s NOVA Geoblog: Lowenstern interview on YouTube. Tip of the hat to Callan Bentley for telling us about this, and to his former student Stef who told him about it. Posted by admin in Alaska, eruptions, Redoubt, United States. A kind reader has alerted me to four interesting timelapse videos of Redoubt made by Bretwood Higman, who lives near Seldovia, Alaska, around 130km away from the volcano. The first, ‘Redoubt Eruption March 27 2009’, shows Redoubt’s eruption column during the eruptions of the evening of 27 March. The big pulse near the middle of the video is the eruption of 19:25 local time, which the AVO reported sent the plume up to 51000 feet/15200 metres. The second, ‘Time lapse of Redoubt Volcano ash’ shows the 26 March ash plume swinging across the film-maker’s snowy Alaska backyard. Third, ’28 March Redoubt Eruption’ is a short video of the 15:29 AKDT 28 March eruption. Finally ‘View toward Redoubt Volcano on 28 March’ captures two eruptions on that day, the 13:40 event and the larger 15:29 eruption. For all our Redoubt coverage: Redoubt « The Volcanism Blog. The references to volcano alert levels on this blog are not authoritative and are not necessarily up to date. You should always check with official sources for the latest alert levels. Web resources are constantly being moved about and changed, and while all the links featured on this blog were working at the time of posting, I can't guarantee they will always operate as advertised. This blog is protected by copyright under conditions that mean pretty much everything is freely available for non-commercial purposes as long as acknowledgement is given. Please click on the 'copyright' tab for the details. The Volcanism Blog cannot be held responsible for any actions you may take after reading what we post here. You can find our full disclaimer on the 'copyright' page. The inclusion of a site in this blog's list of links does not imply any endorsement of that site. The Volcanism Blog has no responsibility for the content of any external sites to which links are provided. Please feel free to comment. Comments should be civil in tone and relevant in content. References to volcano alert levels on this blog are not authoritative. You should always check with official sources for the latest alert levels.